Xenia Enjoys a Second, More Successful Year Playing Host to "Dayton"
ARRL has released a white paper that provides some context to explain proposed alterations to the Articles Of Association and By-Laws that the Executive Committee (EC) of the Board of Directors recommended for full Board passage at its April 21 meeting. Study continues of the so-called "Code of Conduct" for Board members, known officially as the ARRL Policy on Board Governance and Conduct of Members of the Board of Directors and Vice Directors, with changes to be recommended for later Board consideration. At its January meeting, the Board pledged to provide the membership with the rationale and purpose behind proposed changes to the Articles and By-Laws that it had adopted last July. In April, the EC recommended minor revisions to two new amendments to ARRL's Articles of Association and one change to its By-Laws for Board approval at its July 2018 meeting. In all, four changes are being proposed. One proposed change involves the wording of the Articles that address indemnification and personal liability of ARRL Directors, Vice Directors, and officers. Although the Board had adopted new Articles 15 and 16 at its July 2017 meeting, ARRL's Connecticut counsel recommended two revisions, requiring Board approval, to make the wording of those changed sections consistent with Connecticut state statutes. Article 15 addresses personal liability of Directors, Vice Directors, and volunteer and staff officers for damages due to a breach of duty in their respective roles, provided the breach did not involve a "knowing and culpable" violation of law, improper personal economic gain, a lack of good faith, and conscious disregard or sustained and unexcused pattern of inattention amounting to abdication of duty. Article 16 would provide indemnification of Directors, Vice Directors, and volunteer and staff officers for any monetary judgement based on any actions taken or any failure to take action, except under the circumstances listed in Article 15. A change to the wording of Article 1 would add "ARRL, the national association for Amateur Radio" as an informal name for the organization, in addition to "American Radio Relay League, Inc." This adds the informal name of the organization to the formal name spelled out in Article 1 to indicate that either rendering is a proper description of the organization. A clarification of the Directors/Vice Directors election cycle spelled out in By-Law 23 also was required. This involved only a wording change to include the correct years involved. The minutes of the April 21 ARRL Executive Committee meeting include the specific wording of the proposed changes. The Board made two specific edits to the "Code of Conduct" at its January meeting and directed the EC to review the remaining provisions with the intention of presenting those to the full Board. The EC began this process at its April meeting, considering a simplified version of a document recommended by the National Council of Nonprofits but realized it would take longer than anticipated to complete this review and present its findings to the Board and the membership. The EC expects to have a discussion and a proposal for the Board's consideration later this year. 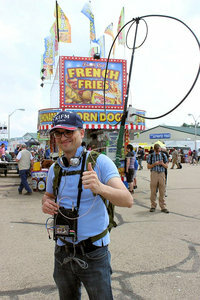 Hamvention® 2018 returned to the Greene County Fairgrounds and Expo Center in Xenia, Ohio, for a second year, earning high marks for attendance, the debut of many new Amateur Radio transceivers, and tasty food. "Other than the rain showers Friday and Saturday, the event seemed to go very smoothly," said QST Editor Steve Ford, WB8IMY, who has been on hand for many past Hamventions. "Many attendees, great food, and a spacious layout that made it easy to get around. It is a much better venue than Hara," he added. Others who commented on the Hamvention Facebook page agreed, although some complained that the flea market area was too small, still muddy, and not as well attended as in past years, when the flea market was Dayton Hamvention. Many credited the Dayton Amateur Radio Association (DARA) for putting on a great show while still addressing needed improvements. Ford said the rain, which included a Saturday thundershower, did not deter the crowds, although indoor exhibit areas were packed at times, reminiscent of the steamy traffic jams of the past at Hara Arena during wet weather. ARRL EXPO, the focus of ARRL's Hamvention presence, saw considerable traffic, and visitors kept those tending the ARRL Store quite busy. Ford said attendees seemed to appreciate the ARRL Stage, where talks on various topics were presented throughout the show. ARRL Marketing Manager Bob Inderbitzen, NQ1R, said the ARRL team included nearly 100 people -- from Field Organization volunteers, Section Managers, Officers, Directors, Vice Directors, partners, served agency representatives, ARRL staff, and members who helped out. Ford postulated that Hamvention 2018 may have witnessed a record number of new Amateur Radio products. New transceivers included Icom's IC-7610, Kenwood's TS-890S, Yaesu's FTDX-101D, and FlexRadio's FLEX-6400M and FLEX-6600M. CommRadio introduced its CTX-10, a compact SDR-based QRP transceiver. Other new products ranged from CW keys, to digital mode interfaces, to audio processors and amplifiers. The August issue of QST will provide a roundup. Hamvention 2018 Amateur of the Year Valerie Hotzfeld, NV9L, ARRL and American Red Cross volunteer, receives her award from Hamvention Awards Committee member Frank Beafore, WS8B. Showers persisted into Saturday. "Hamvention's attempts to mitigate last year's mud issues in the flea market area seemed to help, although the relentless rain proved to be a challenge," Ford observed. "As a result, the indoor exhibits appeared to receive the lion's share of the traffic." 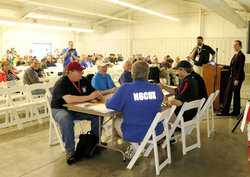 Perhaps as a result of the wet weather, Hamvention forums proved popular. For example, a nearly standing-room-only crowd to the RTTY Contesting forum heard ARRL Southwestern Division Vice Director Ned Stearns, AA7A, discuss FT8 as a possible replacement for RTTY in contest applications. Stearns has been involved in proving out FT8 DXpedition Mode. The ARRL membership forum also drew a substantial crowd. After comments by President Rick Roderick, K5UR, Great Lakes Division Director Dale Williams, WA8EFK, addressed potential changes to the Amateur Radio Emergency Service® (ARES) program. 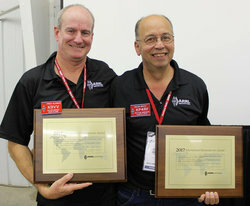 At Hamvention, ARRL Section Managers Oscar Resto, KP4RF (right) and Fred Kleber, K9VV, accepted the 2017 ARRL International Humanitarian Award on behalf of the radio amateurs of Puerto Rico and the US Virgin Islands. The skies cleared on Sunday, and bargain hunters flocked to the Fairgrounds. 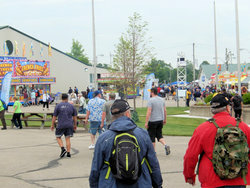 A number of exhibitors commented that it was the largest Hamvention Sunday attendance they'd seen in a long time. Young attendees seemed to be in greater evidence this year, including teams of students interested in combining Amateur Radio with robotics. For example, the First Robotics competition teams were on hand to demonstrate their creations. The Yasme Foundation-sponsored "Ham Radio 2.0 -- Innovation and Discovery" area was a big hit, Yasme Foundation President Ward Silver, N0AX, said. "Subjects ranged from high-bandwidth satellite designs to Summits on the Air (SOTA), HamSCI's 2017 Solar Eclipse QSO Party (SEQP) research, and QSLs." Silver said the goal was to help diverse groups meet and interact. Researcher Nathaniel Frissell, W2NAF, who staffed the HamSCI booth, reported "a tremendous response." 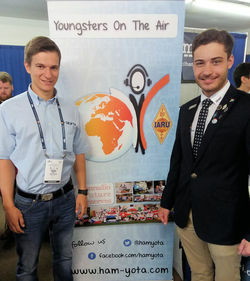 Florian Zwingl, OE3FTA, of Austria, and Koos Fick, ZR6KF, of South Africa represented the IARU Region 1 group Youngsters on the Air (YOTA), promoting YOTA in IARU Region 2 (the Americas). The YOTA "Summer Camp" will be held in August in South Africa -- when it's winter in the Southern Hemisphere. 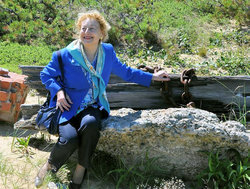 "The weather notwithstanding, the mood was clearly upbeat. The open layout of the Xenia Fairgrounds drew compliments as attendees found it much easier to navigate than Hara Arena," Ford said. 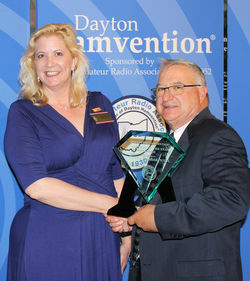 "The Dayton Amateur Radio Association also received kudos for their smooth management of the event. The food vendors drew rave reviews with delights ranging from standard carnival fare to ethnic cuisine." 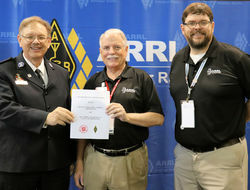 On May 18 at Hamvention, ARRL and The Salvation Army Team Emergency Radio Network (SATERN) renewed the Memorandum of Understanding (MoU) between the two organizations that spells out how they will work together in disaster and emergency responses. ARRL President Rick Roderick, K5UR, signed the MoU on behalf of ARRL on Hamvention's opening day. SATERN National Liaison Bill Feist, WB8BZH, represented SATERN at the signing and delivered a copy of the MoU already signed by The Salvation Army. ARRL Emergency Preparedness Manager Mike Corey, KI1U, said ARRL and SATERN have enjoyed a formal working relationship since 1976, and the MoU was up for renewal. "We spent the last year fine-tuning, updating, [and] revising it," Corey said. "SATERN is celebrating its 30th anniversary this year, so it was a double celebration for them." The MoU "defines the partnership" between ARRL and SATERN and The Salvation Army, in which ARRL and SATERN agree to work together toward common goals, particularly in disaster response, Corey said, adding that the MoU opens the possibility for sharing resources. Corey said ARRL and SATERN also have agreed to coordinate their disaster response activities, to eliminate duplication of effort. "We had an effective and coordinated Amateur Radio response in Puerto Rico and the US Virgin Islands last fall," Corey said. SATERN meets regularly on 14.265 MHz SSB, and is activated for extended periods during disaster and emergency responses. Cooperation was the focus of an ARRL Hamvention forum, "Building Partnerships," attended by more than 100 people. Leading the discussion were Corey and FEMA Community Partnership Specialist Sarah Byrne, who outlined the four "Cs" of partnerships: Collaboration, Communication, Cooperation, and Coordination. Corey reminded those attending the forum that partnerships are only as good as the people participating in them. "It can often come down to one person, and how they interact with the group," he said. To illustrate their points, Corey and Byrne called up three volunteers from the audience and gave each a scenario that required a partnership to achieve. The volunteers then picked three more volunteers as partners. After a few minutes of intense discussions, the new "partners" outlined what resources they had determined were available to them and the partnership's next steps to achieve its objectives. "Coping with Poor HF Conditions" is the topic of the new (May 24) episode of the "ARRL The Doctor is In" podcast. Listen...and learn! Five new ARRL Section Managers have been declared elected to begin their first terms of office on July 1. Section Manager (SM) election ballots were counted in the Indiana and Northern Florida Sections on May 22 at ARRL Headquarters. Other candidates faced no opposition during the spring election cycle. In Indiana, James "Jimmy" Merry, KC9RPX, was declared elected in a very close race with Brian G. Jenks, W9BGJ, the Indiana Section Traffic Manager. Merry received 451 votes, and Jenks received 438 votes. Merry has been the Affiliated Club Coordinator in Indiana since 2005, and is presently serving a fifth term as president of the Bloomington Amateur Radio Club. Incumbent Indiana SM Brent Walls, N9BA, decided not to run for another term after helming the Indiana Field Organization since July 2016. In Northern Florida, Kevin Bess, KK4BFN, outpolled Scott Roberts, KK4ECR, 564 to 447, to succeed current SM Steve Szabo, WB4OMM. Bess is a Northern Florida Assistant Section Manager, and a member of the Daytona Beach CERT Amateur Radio Team and of the Florida Contest Group. Szabo opted not to run for a third term of office after serving since July 2014. Oregon also will get a new Section Manager this summer. David Kidd, KA7OZO, was the sole candidate for the post. He has been an Emergency Coordinator and Assistant Section Emergency Coordinator. Kidd will take the reins of the Oregon Section from John Core, KX7YT, who did not run for a new term after serving for the past 2 years. In the East Bay Section, Jim Siemons, W6LK, will begin an 18-month term as SM on July 1. Because no candidates were nominated by the September 8, 2017, deadline, nominations were resolicited. Siemons was the only nominee to succeed incumbent SM Jim Latham, AF6AQ, who has served as East Bay Section Manager since 2008 and did not run for a new term. In New Mexico, Bill Mader, K8TE, will become the new SM in July. He, too, was the only candidate after nominations had to be resolicited, and he will serve an 18-month term. He follows incumbent SM Ed James, KA8JMW, who did not run again after serving since 2015. Several incumbent Section Managers were unopposed for new 2-year terms starting on July 1. They are Ron Morgan, AD9I (Illinois); Bill Crowley, K1NIT (Maine); Jim Kvochick, K8JK (Michigan); Paul Gayet, AA1SU (Vermont), and Patrick Moretti, KA1RB (Wisconsin). China's Amateur Radio Satellite organization, CAMSAT, has released some details of three new Amateur Radio satellites that could be launched as early as September. Two of the satellites, CAS-5A and CAS-6, will carry transponders; one will have HF capability. CAS-5A, a 6U CubeSat, will have an HF/HF (21/29 MHz) mode linear transponder; an HF/UHF (21/435 MHz) mode linear transponder; an HF CW telemetry beacon; VHF/UHF mode linear transponder; a VHF/UHF mode FM transponder; a UHF CW telemetry beacon, and UHF AX.25 4,800/9,600-baud GMSK Telemetry. Transponders will have 30 kHz passbands, except for the H/U unit, which will be 15 kHz. A launch at sea is planned for CAS-6, which will be placed into a 579 × 579 kilometer, 45° orbit. The first science results from the Solar Eclipse QSO Party (SEQP) last August 21 have been published in the American Geophysical Union journal Geophysical Research Letters. In the paper, "Modeling Amateur Radio Soundings of the Ionospheric Response to the 2017 Great American Eclipse," New Jersey Institute of Technology (NJIT) researcher Nathaniel Frissell, W2NAF, and team present Reverse Beacon Network (RBN) observations of the SEQP and compare them with ray tracings through an eclipsed version of the physics-based ionospheric model SAMI3. HamSCI, the Ham Radio Science Citizen Investigation organization, sponsored the event. "From a ham radio perspective, this paper very clearly shows the effect of the eclipse on not just a few, but a very large number of contacts," Frissell told ARRL. "You can see from the charts that activity drops off steeply on 20 meters during eclipse totality, while 80 and 160 meters open up. On 40 meters, you can see how the contact distance increases in step with the eclipse." Frissell said another key aspect of the paper is that the researchers were able to use ray tracing to compare the observations to a physics-based numerical model of the eclipsed ionosphere. 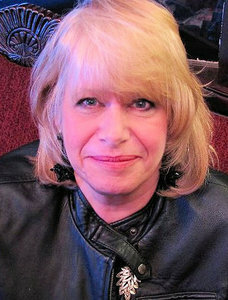 ARRL Business Services Manager Deb Jahnke, K1DAJ, of Colchester, Connecticut, died on May 17 after a lengthy illness. She was 66 and had been on the ARRL Headquarters staff for nearly 40 years, starting as a file clerk. She went on to serve as Deputy Circulation Manager, Circulation Manager, Publication Sales and Warehouse Manager, and Business Services Manager (including Advertising). She met her husband of 31 years, ARRL Contest Branch Manager Bart Jahnke, W9JJ, at Headquarters. "This is a tremendous loss for ARRL," said ARRL CEO Barry Shelley, N1VXY. "Those of us who knew Deb will miss her remarkable spirit and direct approach to both the work of the ARRL and life. Deb loved the outdoors, including sharing time with family in her flower garden, and with their dogs and her rescue horses." For many years, she was a fixture at Hamvention® and at other major Amateur Radio shows, organizing and overseeing the operation of ARRL's exhibit and store. The family has requested that contributions be made in Debra Jahnke's name to the American Cancer Society, the Shriners Hospitals for Children, or St. Jude Children's Research Hospital. Friends may leave remembrances on the Belmont Funeral Home site. Read more. The "Scouts BSA" program change is expected to enhance ham radio opportunities for young women. Boy Scouts of America's Radio Scouting Coordinator Jim Wilson, K5ND, says that, although the program name for ages 11 to 17 will change to "Scouts BSA" and begin admitting girls starting on February 1, 2019, the organization's name remains the same. "Perhaps the big difference is that girls will now be eligible to earn the Radio Merit Badge as part of their Scouting program," Wilson told ARRL. "Girls are already a part of Venturing, a coed program for ages 14 to 20." He pointed out that Venture Scouts of both sexes have always been able to earn the Amateur Radio Operator Rating Strip and the Morse Code Interpreter Strip. "Girl Scouts have always been welcome to participate [in JOTA]," Wilson added. "Now, they'll be participating in not only Girl Scouts, but also in Cub Scouts and Scouts BSA." Wilson noted that Scouting organizations in most other countries have had female members for quite a while now. Tad Cook, K7RA, Seattle, reports: Sunspot activity resumed this week, after no sunspots for 7 consecutive days. The average daily sunspot number of 7.7 was up from 6.4 in the previous reporting week. The average daily solar flux was 70.1; little changed from last week's 70.2. The average daily planetary A index was 5.4, down from 8.4 the previous week, but the really interesting and seemingly anomalous number was a May 22 mid-latitude A index of 55, up from 3 on the previous day. This drove the average mid-latitude A index for the week to 12.3 from 9 in the previous week. The Fredericksburg K index on May 22 briefly reached 9, the maximum possible value. If this were to continue for a full day (perhaps during a Carrington event?) the A index for that day would be 400, thankfully an unheard of and disastrous number. 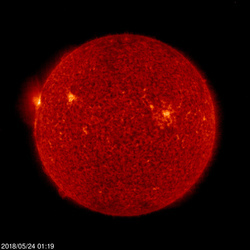 Predicted solar flux is 74 on May 24; 75 on May 25-27; 74 on May 28; 72 on May 29-30; 70 on May 31-June 6; 68 on June 7-16; 69 on June 17-20; 70 on June 21-July 3, and 68 on July 4-7. Predicted planetary A index is 10 and 8 on May 24-25; 5 on May 26-31; 18, 28, 16, 16, 14, 12, and 8 on June 1-7; 5 on June 8-12; 8 on June 13; 5 on June 14-18; 16, 12, and 8 on June 19-21; 5 on June 22-27; 16, 26, 16, 14, 12, 12, and 8 on June 28-July 4, and 5 on July 5-7. Sunspot numbers for May 17-23 were 0, 0, 0, 0, 12, 12, and 30, with a mean of 7.7. The 10.7-centimeter flux was 69, 69.4, 70.3, 68.8, 69.6, 70.8, and 73.1, with a mean of 70.1. Estimated planetary A indices were 10, 4, 3, 3, 3, 6, and 9, with a mean of 5.4. Estimated mid-latitude A indices were 9, 3, 3, 3, 3, 55, and 10, with a mean of 12.3.